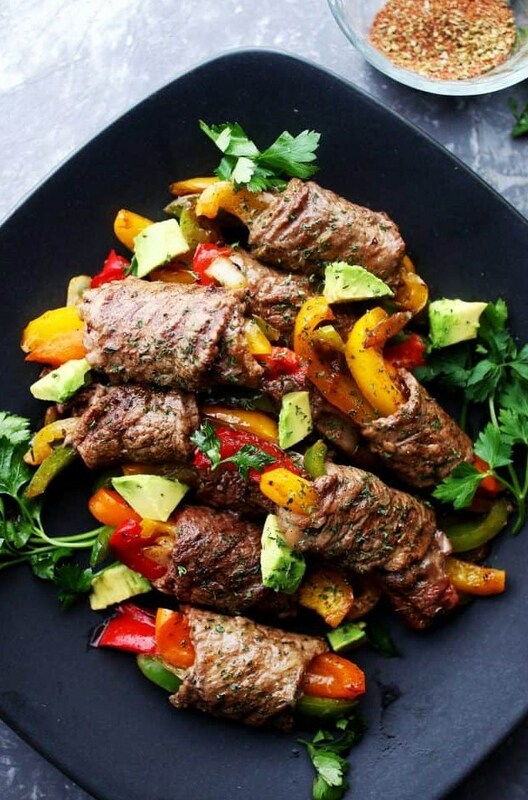 Steak Fajita Roll-Ups - Ditch the flour tortillas and make this amazing low-carb version of your favorite steak fajitas! Prepare the fajitas seasoning mix and set aside. Cut the steak into 2-inch wide by 6-inch long strips. Heat olive oil in a grill pan over medium-high heat and add pepper strips and sliced onions to the grill pan; season with salt, pepper, and a sprinkle of the fajitas seasoning mix. Cook for about 4 to 5 minutes, or until tender. Top each slice of steak with the vegetables; roll up and secure with a toothpick. Add remaining olive oil to the grill pan; heat it up and add the roll-ups to the pan. Cook until browned, about 2 to 3 minutes per side. Remove from heat, remove toothpicks, and transfer to a serving plate. Squeeze lime juice over the roll ups and garnish with chopped parsley or cilantro.